When the Desktop App is used for Lock & Open / Save & Unlock processing to edit files locally while maintaining a “Lock” in the cloud, local copies of locked files are retained by default in the My Docs Online Temp Folder. This can facilitate recovery of files. Users wanting no files to be retained locally, for enhanced HIPAA compliance or other reasons, can opt for all locked files to be removed from the local machine when Unlock processing is complete. Temporary files that have been “Viewed” rather than “Locked” are always deleted when processing is complete. 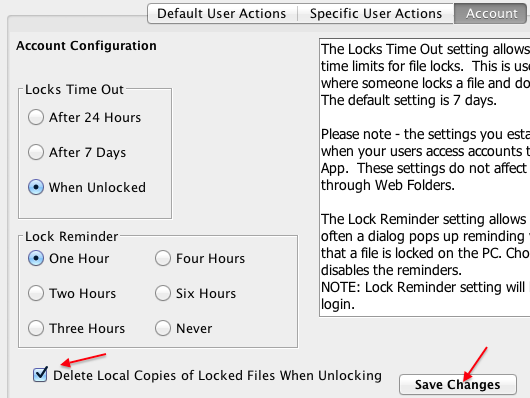 Choose the “Account” tab and check “Delete Local Copies of Locked Files When Unlocking” and then Save Changes. The setting will be in effect for all users in the group account.